If there’s one thing you’ll take away from watching “93Queen,” it’s likely to be this: You do NOT want to get in Rachel Ruchie Freier’s way. Paula Eiselt’s debut documentary follows this tenacious, dynamic woman — and those she rallies to her cause — as she launches the first all-female ambulance service in New York to serve the women of the Hasidic community in Borough Park, Brooklyn. The result is both a compelling glimpse inside an insular community and a fascinating portrait of a determined feminist. As a traditional orthodox community, the Borough Park Hasids have strict rules about gender roles and interactions. That can lead to issues when women, who aren’t allowed to be touched by men they’re not married or related to, have emergency OBGYN needs and only male emergency medical workers (in the form of the impressive-but-male-only Hatzolah ambulance corps) are available. Enter the Ezras Nashim, a woman-organized and -staffed group of volunteer EMTs. Freier doesn’t let anything stop her from reaching her goal of getting Ezras Nashim off the ground. Not frequent, vocal, personal pushback from the community’s more traditional members. Not disagreements within the group of women who are working with her. Not even wrong turns when she’s driving the ambulance to her first real call. Luckily, she has plenty of support to help her realize her dream — including her (comparatively) enlightened husband and many other Borough Park women who love the idea of women helping women. MaryAnn Johanson Director Paula Eiselt has found a terrific story for her debut documentary, one that speaks to the almost impossible barriers that so many women, in communities, face as we try to live our best lives. Her protagonist, Rachel “Ruchie” Freier, may actively dismiss the notion that she is in any way a feminist, but her work and her ambitions — to be taken seriously for her mind, to help other women whose needs aren’t given due consideration in her ultraconservative culture — are the epitome of feminism. She’s a true heroine. Read full review. Nikki Baughan: “Fasten your seat belt and let’s move,” says Hasidic Jewish woman Rachel ‘Ruchie’ Freier early on in 93Queen, and you’d be wise to follow her advice. The subject of Paula Eislet’s fascinating documentary is a one-woman dynamo, a fiercely religious Jewish wife and mother who also happens to be a lawyer who dreams of becoming a civil court judge. 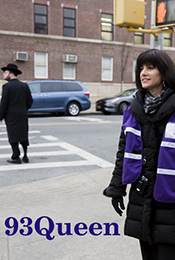 Ruchie is determined to set up an all-female group of volunteer EMT’s, named ‘Ezras Nashim’ (Women For Women) to serve Brooklyn’s closeted Hasidic Borough Park community after the all-male force, Hatzolah, refused to allow women to join. Read full review. Sandie Angulo Chen: You don’t need to know your fleishig from your milchig to enjoy director Paula Eiselt’s documentary about a small group of pioneering Hasidic women who form a “by women for women” volunteer EMT corps as an alternative to the all-male run Hatzolah. The film focuses on affluent mother of six Ruchie Freier, who already bucks tradition by being a practicing attorney in an ultra-orthodox community that doesn’t value women’s education or work beyond the domestic sphere. She is the leader of the women who want to be EMTs but were denied the chance to be a subgroup of Hatzolah. Through interviews with Ruchie and other women in Ezras Nashim, (which means “helping women”), it’s clear just how much opposition they face not only from the powerful Hatzolah men but also from the overall Hasidic community, where feminism is a dirty word. Read full review. Marilyn Ferdinand: “The wisdom of the market” was a phrase that came to mind as I watched 93Queen. Simply put, this phrase directs entrepreneurs to look for opportunities to fulfill unmet needs, confident in the belief that consumers in that particular market will respond positively. The market orthodox Jewish director Paula Eiselt examines in her first feature documentary comprises Hasidic women in Borough Park, Brooklyn, in need of an emergency medical service that respects their religious belief that only their husbands may touch or see their bodies. The entrepreneurs are dynamo Jewish lawyer, wife, and mother Rachel “Ruchie” Freier and other like-minded Hasidic women who challenge the neighborhood’s all-male volunteer service by trying to start up an all-female counterpart. The results, predictably, show that there is nothing truly free about the free market and that women with a common-sense idea that all Orthodox Jews should embrace find that patriarchy is the stronger of the two beliefs. This terrific film, a warts-and-all look at a community coming to grips with change, is entertaining, suspenseful, joyful, and infuriating in equal measure. Try it. You’ll like it. Anne Brodie: The amazing story of Rachel Freire illustrates the old saw “you can do anything you put your mind to”. Paula Eiselt’s documentary 93Queen follows the turbulent journey an upper middle class Hasidic Jewish lawyer with an ambitious plan to create a specialized ambulance service for the community. Here’s the catch. The setting is Borough Park, Brooklyn, the largest density of Orthodox Jews in the US. The usual model for the Hasidic woman is to raise children and run the home and to step out to work and aspire to become a business owner is to defy the Torah. Plus there is a Hasidic Jewish ambulance service, all male. Her point is that Orthodox women cannot touch a man outside her immediate family, which raises problems if a woman needs an ambulance. Brilliant idea. However, community backlash is swift and subtle, and not so subtle. Men make prank calls to the hotline, abuse her verbally and online. Her service, Ezrus Nashim ‘helping women’ with 50 members, is a success from day one – and she wore her high heels to the first call! It’s a reality. Freire furthers infuriates the elders when she runs for civil court judge – “It’s not modest” – and wins, becoming the first ever female Hasidic Jewish judge in the US. It’s a great story – but overshadowed by blatant sexism. After all, she’s not modest. She’s too busy saving lives. Jennifer Merin 93QUEEN, filmmaker Paula Eiselt’s first feature, takes us into the closed Hasidic community of Borough Park, Brooklyn, where orthodox tradition preserves a wide divide between women and men. Women are expected to live life as homemakers and mothers. They are not allowed to touch or be touched by men who are not their husbands. Strictly observed,that custom presents a real problem when it comes to emergency medical care — especially when the emergency has to do with an ob-gyn issue such as childbirth. Although the Hasidic enclave is home to Hatzolah, the world’s largest volunteer ambulance corps, that esteemed organization has banned women from its ranks. 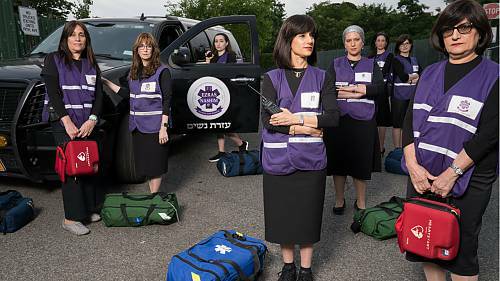 So, a tenacious group of women have formed Ezras Nashim, the first all-female volunteer ambulance corps in the US, to serve and transport women who do not wish to be touched by men who are not their husbands. 93QUEEN is the story of these women. The documentary’s central character is Ezras Nashim founder Rachel “Ruchie” Freier, a Hasidic lawyer-turned-Judge who has clearly challenged the patriarchy and is determined to provide dignified emergency medical care to Hasidic women of her community. Ruchie is quite a character! Kristen Page Kirby: The old saw about Ginger Roberts and Fred Astaire applies to 93Queen, though instead of dancing, Rachel Freier and her all-woman Hasidic ambulance squad are not only doing “men’s work” in heels, they’re doing it in skirts, pantyhose, long-sleeved blouses and wigs. It would be easy to dismiss 93Queen as a typical woman-against-the-world documentary — albeit a fascinating woman in a unique section of the world — and the movie does that well. But as Freier presses forward with her vision for Ezras Nashim, the questions she and the film wrestle with get deeper and more complicated. It’s easy for non-Hasidic viewers to understand why Ezras Nashim is necessary and beneficial to the community, and why the rules and traditions they face are wrong when viewed through the light of the mainstream world. It’s when Freier and the rest of the squad start imposing other rules — particularly the one that single women can drive and dispatch, but not serve in a medical capacity — that the viewers have to ask themselves how Freier bristles against some obstacles while putting in place obstacles that don’t affect her. Is it really a victory for women if the victory doesn’t benefit all women — and when the limits of that victory are placed by the women who won? Esther Iverem: 93Queen gives rare insight into the Intertwined issues of religion, feminism and anti-woman ideology in Brooklyn’s Hasidic Jewish community. As this documentary follows its brave protagonist in her quest to establish an all-woman’s volunteer EMT service, the filmmakers are unflinching in how they capture the competition between personal ambition and group bias, and the claim for who has God’s blessing. Pam Grady: Technical aspects are sometimes rocky in this documentary about women attempting to start an all-female EMT service in an ultra-Orthodox Jewish Brooklyn community, but the content is engrossing. Most of the film’s focus is on Ruchie Frier, a mother of six whose freezer is filled with her homemade challah. But she is also someone who got her law degree at 40 and aspires to become a judge who is now pouring her considerable energy into making the ambulance service a reality — and becoming a lightning rod for controversy in what is a deeply conservative patriarchy. What unfolds is a deeply affecting portrait of a woman who is observant in her faith, yet determined to challenged its strictures from within to the benefit of all the women in her community. Cate Marquis Documentary filmmaker Paula Eiselt brings us an inspiring story of women helping women in 93Queen. A group of women in a Brooklyn Hasidic community see a need for an ambulance service to help women in their community, a service they dub Ezras Nashim (“Helping Women”). Read full review.